The years 2015-2016 marked a double anniversary of the founder of gerontology, a foundational figure of modern immunology, aging and longevity science, and of modern medicine generally – Elie Metchnikoff (May 15, 1845 – July 15, 1916). On May 15, 2015, we celebrated the 170th anniversary of his birth, and on July 15, 2016, we marked 100 years since his death. And 2018 marks 110 years since his Nobel Prize in Physiology or Medicine (the Nobel Lecture was delivered on December 11, 1908). This decade could be truly declared “The Decade of Metchnikoff”! For the proponents of healthy longevity and advocates of aging research, Metchnikoff has a special significance. Metchnikoff is of course known as a pioneering immunologist and microbiologist, a vice director of the Pasteur Institute in Paris, and the Nobel Laureate in Physiology or Medicine of 1908 for the discovery of phagocytosis (a major contribution to the cellular theory of immunity). Yet, he may also be well credited as “the father” of gerontology – the disciplinary term he coined. Both the terms “gerontology” (“the study of aging”) and “thanatology” (“the study of death”) were coined by him in the Etudes On the Nature of Man, published in 1903, which may mark the beginning of these scientific fields.1 To the present day, his scientific reputation has remained high around the world. In fact, Metchnikoff can be considered a unifying cultural symbol for many nations. There is a tradition to celebrate the anniversaries of great persons (scientists, artists, writers, politicians, generals) to promote the area of their activity and popularize their ideology. 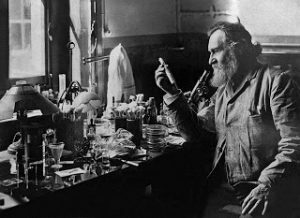 It may be hoped that honoring the anniversary of Metchnikoff can serve to promote and popularize the science and ideology of healthy life extension, including the state level. The “Metchnikoff Day” (held on the day of his birth – May 15) can provide an impulse for organizing topical meetings and conferences, a stimulus for research, and publications in the media, dedicated to Metchnikoff’s legacy and continuation of his life’s work – the study of aging and longevity. This may play a positive role not only for the advancement and popularization of research of aging and healthy longevity, but also for the promotion of optimism, peace and cooperation. Indeed, in 2015, events in honor of the Metchnikoff Day were held in Ukraine, Russia, UK, Israel, Cyprus.4 It may be hoped that, following these examples, more events and publications will be held around the world in honor of this day in the future. It is possible to dedicate additional special days to organize internationally coordinated actions and educational campaigns in support of longevity science. Thus, in 2013 through 2016, such actions were organized on October 1 (“The International Day of Older Persons” or “The International Longevity Day”), March 1 (“The Future Day”), February 21 (“Jeanne Calment’s day” in honor of the longest lived human, with a certified 122.5 years lifespan, February 21, 1875 – August 4, 1997).5 Yet, “Metchnikoff’s day” on May 15, can be one of the most unifying, uplifting and educational. Can there be a stronger call to thought and to action for the combat of degenerative aging and for the prolongation of healthy human life? Let us hope this call will continue to be heard and acted upon. I.I. [Ilya Ilyich] Metchnikoff, Etudy o Prirode Cheloveka (Etudes On the Nature of Man), Izdatelstvo Academii Nauk SSSR (The USSR Academy of Sciences Press), Moscow, 1961 (1903). The first French edition, Elie Metchnikoff, Études sur la Nature Humaine, was published in Paris (Masson) in 1903. The Russian translation used here was done by Elie Metchnikoff and his wife Olga. The book is also available in English (The Nature of Man: Studies in Optimistic Philosophy, translated by P.C. Mitchell, Putnam, NY, 1908 (1903), https://archive.org/details/prolongationofli00metciala). Unless otherwise specified, all the excerpts quoted in the present work are in my translation. Ilia Stambler, “Elie Metchnikoff – the founder of longevity science and a founder of modern medicine: In honor of the 170th anniversary,” Advances in Gerontology, 28(2), 207-217, 2015 (Russian), 5(4), 201-208, 2015 (English). Elie Metchnikoff, Sorok Let Iskania Razionalnogo Mirovozzrenia (Forty Years in Search of a Rational Worldview), 1914, in I.I. Metchnikoff, Academicheskoe Sobranie Sochineniy (Elie Metchnikoff. Academic Collected Works, Ed. G.S. Vasezky), Academia Medizinskikh Nauk SSSR (The USSR Academy of Medical Sciences), Moscow, 1954, vol. 13, pp. 9-22.